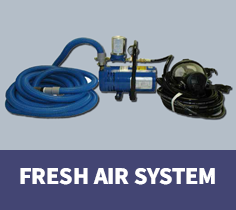 Fresh Air System | Hawk Research Laboratories, LLC. The Fresh Air Respirator System includes a full face supplied air respirator, features a special side down tube connection to hoses that can be easily draped over the shoulder. Its ultra-light air hose provides maximum comfort and maneuverability. The wide angle lens provides maximum visibility. Peel off lens cover available for over spray. Three-year limited warranty on full-face mask and one year unconditional warranty on pumps.